Ronda Rousey took to Instagram today to announce that WWE has barred her husband, UFC Fighter Travis Browne, from Monday Night RAW. 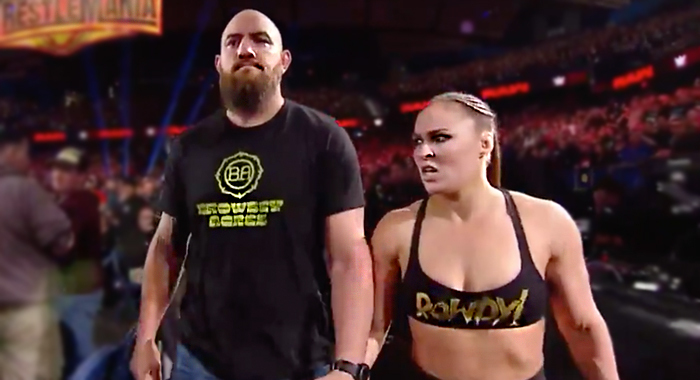 Browne pulled Rousey out of a scuffle with security on last night’s edition of the WWE’s flagship program, and actually elbowed one of the guards in the face. The announcement is obviously a storyline, as Rousey promotes a clip of the fight from RAW at the end of her comment. Rousey is set to defend her WWE RAW Women’s Championship against Charlotte Flair & Becky Lynch at WrestleMania 35. Browne has not fought for the UFC since July 8th, 2017 after a 2nd round loss to Alexey Oleynik.